Heading into year two of the project, the Belkin Pro Cycling team will today detail its ambitions for the 2014 season at its team launch at the Nederlands Instituut voor Beeld en Geluid in Hilversum. 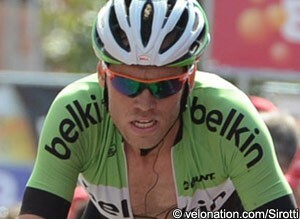 The WorldTour squad evolved out of the structure of the Rabobank squad and, after several months as Team Blanco last year, unveiled a new sponsorship in the form of Belkin. It had a solid first season, netting 38 wins including Bauke Mollema’s stage seventeen victory in the Vuelta a España. The team ended the season on a high note when it clocked up all nine stages plus the overall in the 2.HC Tour of Hainan. Watch the presentation below [click video to start], and come back later for more from the launch.